Suspected terrorists have attacked a luxury hotel complex in Nairobi, the capital city of Kenya, with several people killed, BBC reports. 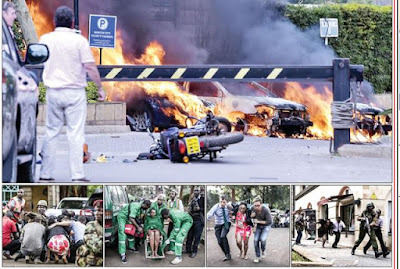 Gunfire and blasts were heard at the compound in the Westlands District of the Kenyan capital, which houses the DusitD2 hotel as well as offices. The Somalia-based militant group al-Shabab claimed it was behind the attack. People, some with bullet wounds and covered in blood, were escorted out of the building by heavily armed police. The attack began at about 15:00 local time (12:00 GMT). Kenyan media say the gunmen arrived at the complex by car, shot their way past guards, threw bombs at vehicles in the car park and entered the building. The number of victims is unclear. One photographer for Agence France-Presse reported five bodies slumped over tables on a restaurant terrace in the complex. The five-star DusitD2 hotel has 101 rooms. Located in the Westlands suburb, minutes from the capital’s business district, it has its own spa and several restaurants. Kenya has seen a number of terror attacks in recent years, most notably in areas close to the Somali border and in the country’s capital.